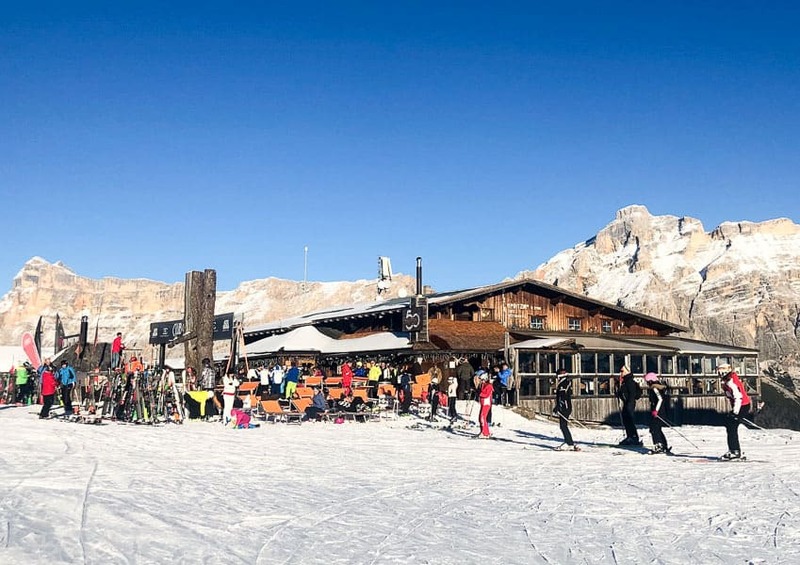 Alta Badia in Italy presents skiers with a delicious dilemma. 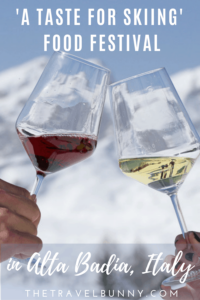 Each season the culinary festival ‘A Taste for Skiing’ dishes up 130 km of beautifully groomed pistes paired with first class chefs, gourmet food and excellent Tyrolean wines. 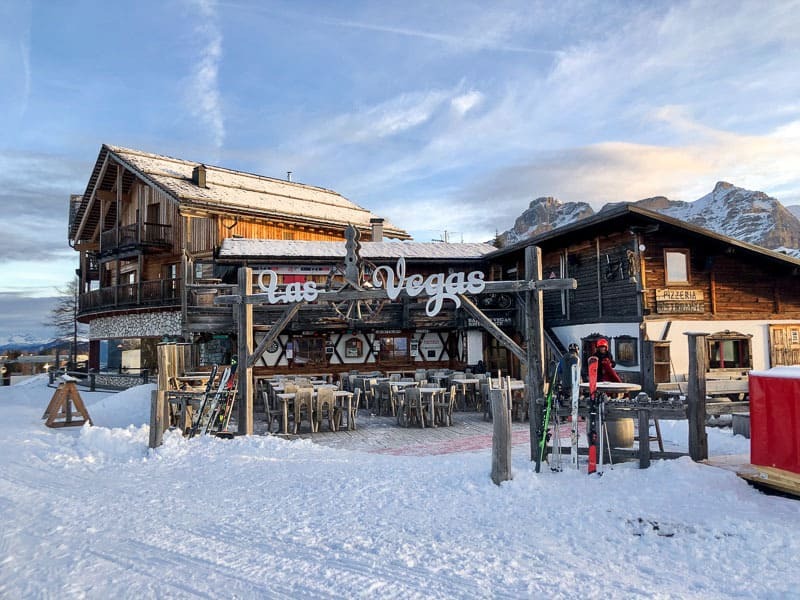 With ten mountain huts taking part and activities like ‘Breakfast with Powder Snow’ and ‘Sommeliers on the Slopes’, snow-goers are spoilt for choice. After a few days of eat, ski, repeat bigger ski pants may be required. 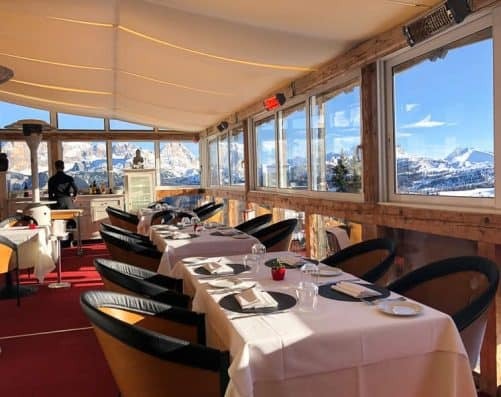 It’s not often that gourmet chefs and mountain huts go hand in hand but this is just one of the ways A Taste for Skiing brings first class food to the slopes. 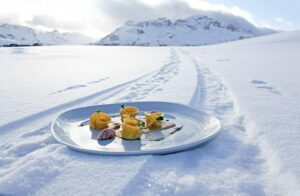 To celebrate the event’s tenth anniversary ten gourmet chefs have paired with ten mountain huts. 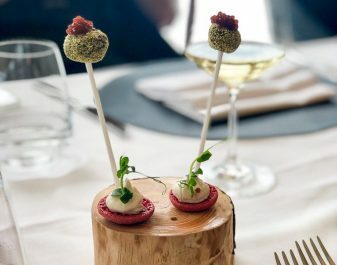 Between them they’ve created ten exceptional dishes to bring gourmet food and excellent wines to food-lovers and skiers alike. 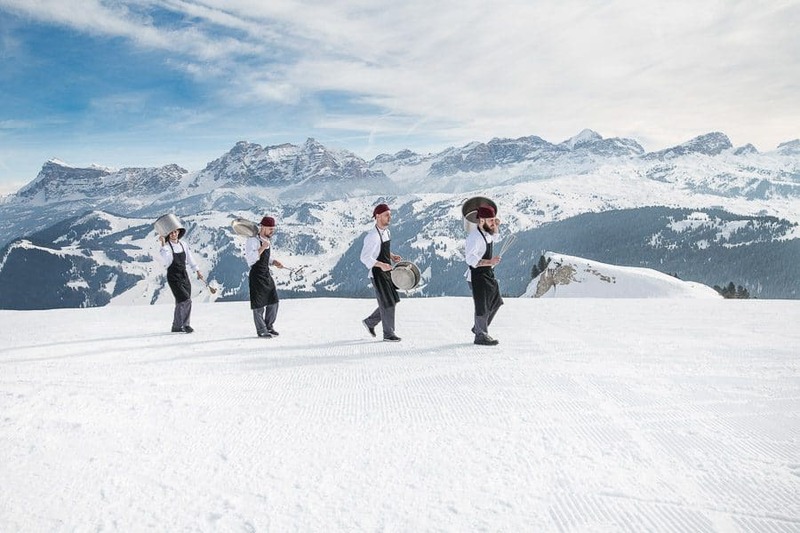 Taking part this year include Alta Badia’s home grown chefs Norbert Niederkofler, Nicola Laera, Matteo Metullio and Giorgio Locatelli. 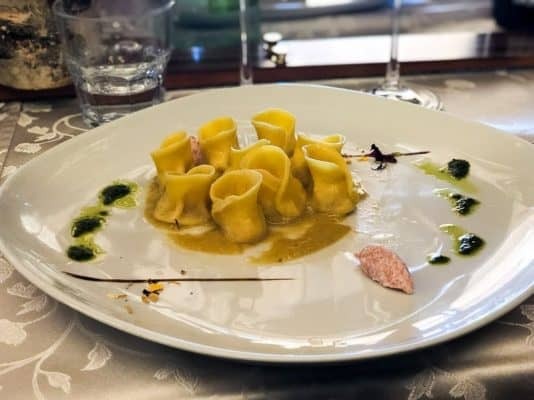 If you’re thinking this sounds expensive you’d be wrong because prices start from €15 per dish including a recommended matched glass of South Tyrol wine. I’ve paid more for cheesy chips up a mountain. At the higher end prices go up to around €36 including matched glass of wine. 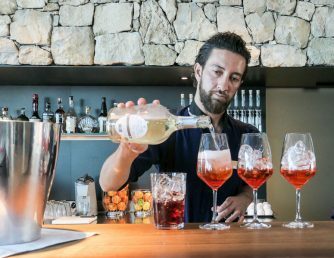 Our first taste of Alta Badia hospitality follows a gondola ride to the stylish Piz Boe Alpine Lounge in Corvara. 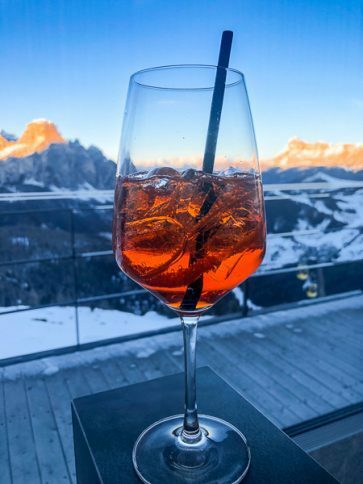 The mountain views stretch out before us my Spritz complementing the colour of the Dolomites. The setting sun reflects on the limestone sending them shades of rust, orange, ochre and coral pink. The phenomenon is known as ‘Enrosadira’ in Ladin which is the local language (pronounced lad-in). 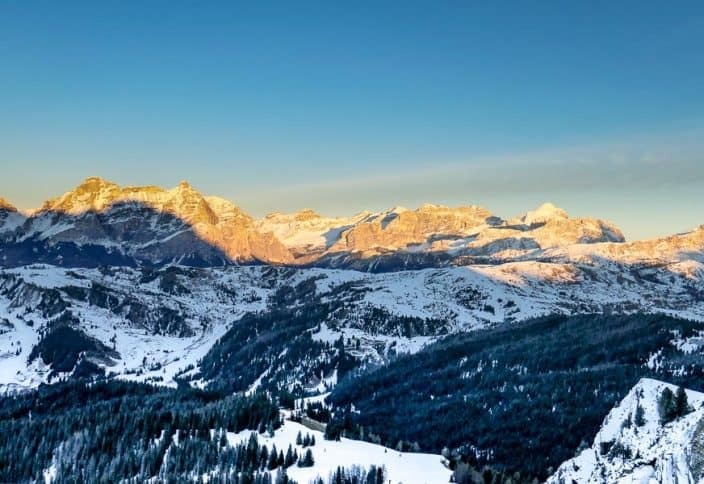 This ancient local language is still spoken by around 30,000 people in Alta Badia and Trentino. Ladin tradition carries on into the evening with dinner at Maso Runch farmhouse where we’re welcomed by Enrico Nagler. 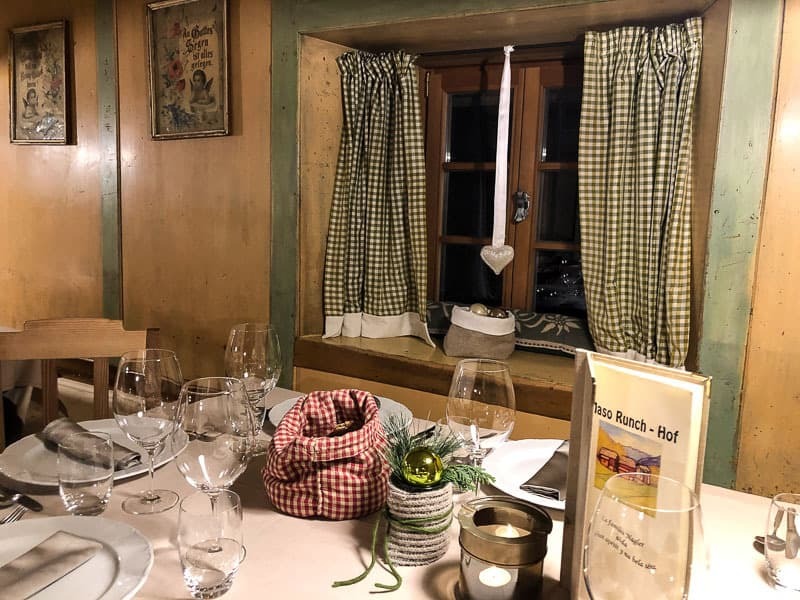 He and three generations of his family run the farm; growing, cooking and serving guests an authentic Ladin menu that hasn’t changed in over 30 years. If it ain’t broke… The food is full of local flavour, wholesome, hearty and there’s lots of it. 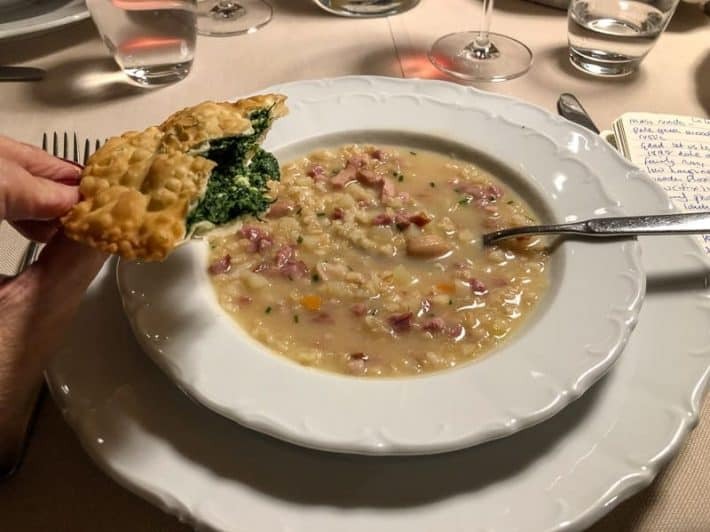 Barley soup with smoked pork meat, homemade ravioli, perfectly al dente, stuffed with spinach and ricotta. 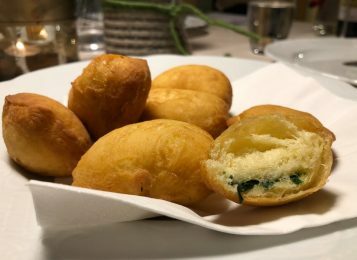 We devour savoury turnovers, little dumplings stuffed with spinach, pork shanks, polenta and sauerkraut. As we eat we fall into a comfortable silence of mutual appreciation. 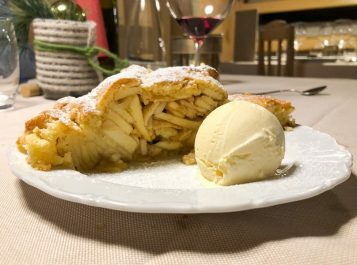 We’re offered dessert, apple strudel and ice cream. Despite being full to the brim we decide it’d be rude not to and we share one serving between five of us. Day two dawns and it’s early doors for a skidoo ride up to Las Vegas Lodge mountain hut for breakfast. It’s barely light and we’re cosied up in blankets as we race up the slopes towards the ever-brightening sun. We’re greeted by Ulli, the owner, who shows us around Las Vegas Lodge, one of only two places to stay in Alta Badia above the snow line. We’re 2050 metres above sea level. After months of work the lodge now has 11 stylish guest rooms, a fresh modern dining room with panoramic views, a more rustic-style restaurant and a huge balcony with sauna and hot tub. This morning’s feast on the piste starts with a continental buffet breakfast with coffee and orange juice followed by a choice of cooked breakfast from the menu. The perfect start to a day’s skiing. There’s a bonus too. As we’re first up the mountain we’re also the first to ski back down pristine slopes. It’s very special excursion and worth getting up early for. Who doesn’t love a freshly groomed piste? We call it the corduroy effect! We spend the morning cruising the blues and it’s as much as I can do to tear my eyes away from the endless views. The Dolomites are a UNESCO World heritage site and it’s easy to see why. The limestone crags which encircle the area and change colour as the sun sets are utterly magnificent. 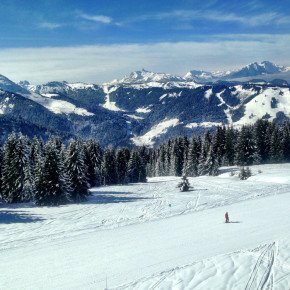 There’s a good mix of terrain to ski in Alta Badia which suits skiers from beginners through to intermediates. 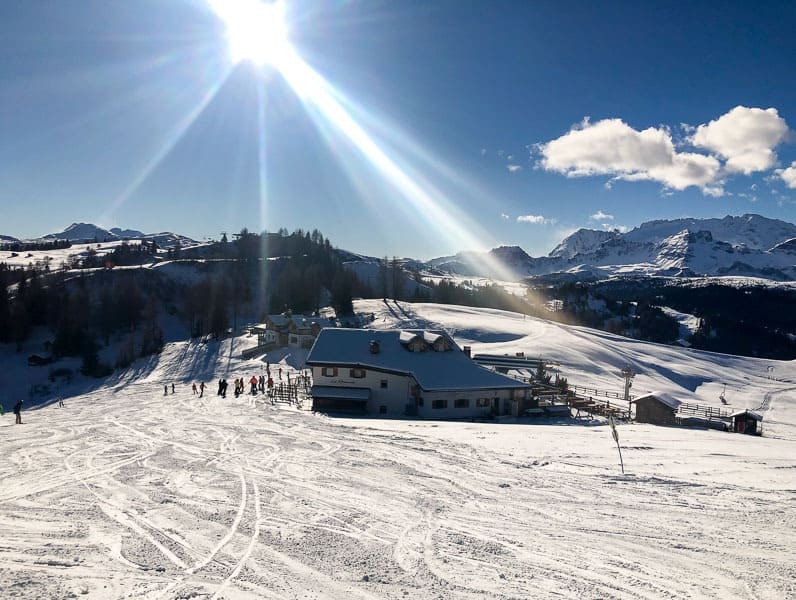 Adrenalin seekers might want to head down the men’s giant slalom After an initial steep start skiers can choose between two runs where the track splits off to the black run Gran Risa or Alping, a red run. 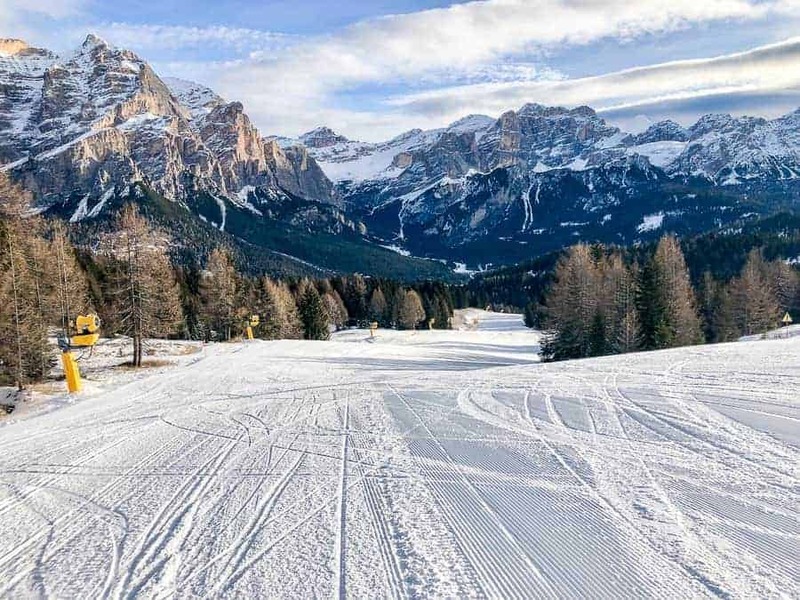 There’s also access to the Sellaronda 42 km ski circuit which can be completed in a day by intermediate skiers. The snow was pretty good during our visit but an army of snow cannons keep the slopes skiable. We work up an appetite on some red runs before heading to popular Club Moritzino mountain hut for lunch. Moritzino are partnered with Chef Giorgio Locatelli this season. The party’s already started when we arrive with a DJ on the outside terrace pumping out sounds. Inside, the mountain views are superb and the food even better with a good choice of seafood and fish on the menu. 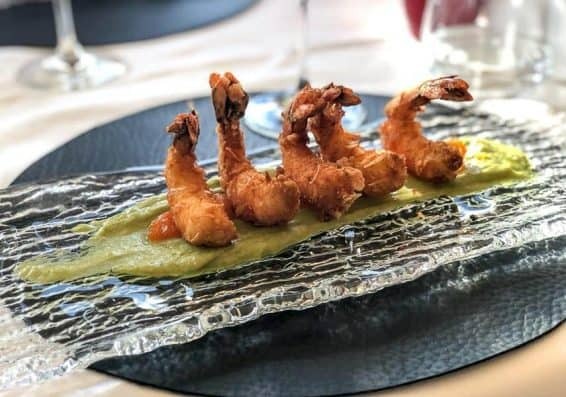 I choose plump almond crusted prawns served on a pumpkin, mustard and avocado puree. The contrast in textures and flavours are a delicious combination. 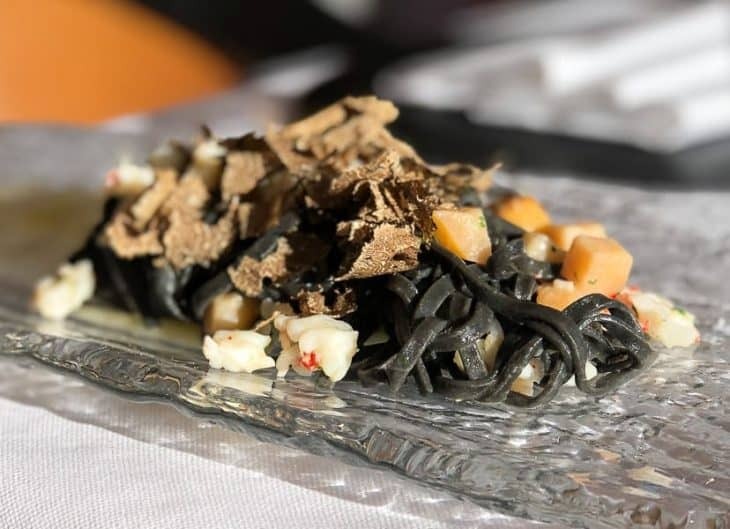 Next comes Tagliolini with cuttlefish, prawns, apples on carpaccio of scallops and black truffle and was again excellent although I’d give the carpaccio a miss next time which had lost its flavour. Again we were too full for dessert but a variety of chocolate beans and biscuits satisfied any sugar cravings. 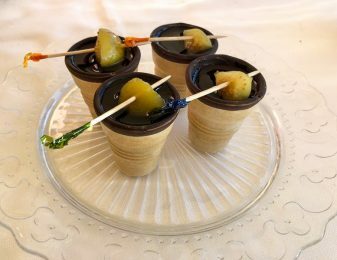 Schnapps served in a mini chocolate-dipped cone finished off the meal nicely. Our lunch at Club Moritzino set us up nicely for an afternoon’s skiing and we play on the slopes until the mountains glow gold in the approaching sunset. 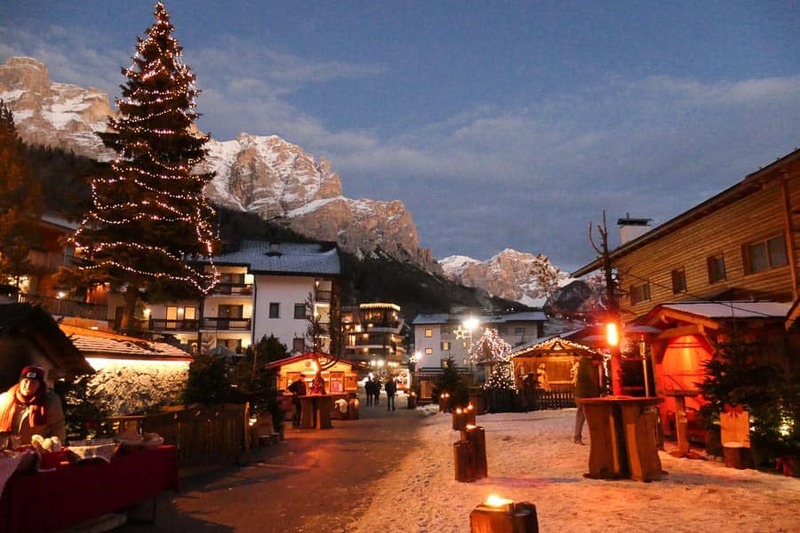 Alta Badia is made up of five villages and our base was Hotel Diamant in San Cassiano. There’s a small Christmas Village near the hotel where the aroma of mulled wine and roasting chestnuts wafted on the air. I had time for a quick mooch before heading off for dinner in neighbouring village Corvara. 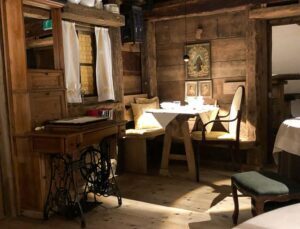 There’s a small main street with cosy bars, shops and restaurants, including Norbert Niederkofler’s 3 Michelin star St Hubertus. La Perla hotel in Corvara is the venue for dinner at Michelin-starred restaurant La Stüa de Michil. We’re led along stone corridors and through a rustic wooden door into a seventeenth century candlelit parlour. Our table takes centre stage while smaller, intimate tables are set in ambient corners. Low ceilings and wood-panelled walls compliment the charming rustic furniture and fresh flowers run the length of our table. As we sit a small footstool is placed beside me for my handbag. The level of care and attention to detail continues throughout the meal which is unhurried and relaxed. 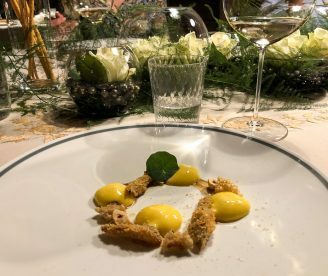 Chef Nicola Laera was born and grew up in Alta Badia and his Ladin culinary heritage reflects in the flavours and nuances of his dishes. We enjoyed dishes from the Nicola Laera New Horizons menu with paired wines. A Champagne aperitif starts proceedings followed by an amuse bouche duo; rabbit with red onion and a lemon cheese. Following this we dip into a light trout and caviar soup with a dusting of cinnamon accompanied by a full-bodied local Chardonnay. 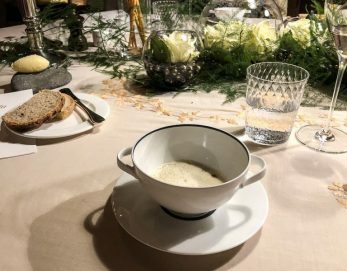 A pretty dish of smoked yolk foam, Jerusalem artichoke cream with black bread and Piedmont hazelnut arrive next. Flavours so far have been delicate but with the next course the intensity is nicely heightened. 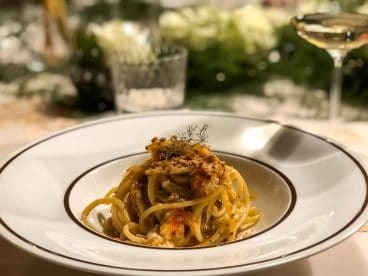 I go for pasta maker Martelli’s spaghetti, garlic, oil and red chilli with king crab which has a spicy bite to it. Next on the menu is lamb from the Pyrenees, black garlic, peas and mint tofu with Borettana onion. 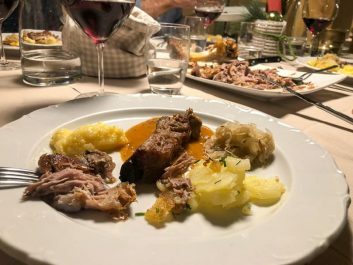 The lamb was utterly succulent and my favourite dish of the meal served with a Tuscan Syrah. Before dessert we’re served an unexpected gin and tonic – in my opinion the best kind of gin and tonic. 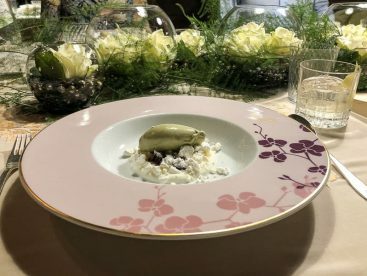 We end the meal with a dessert of ‘mountain aromas’, a light as a feather fondant with hints of mountain herbs which contrast nicely with the sweet, crisp meringue. 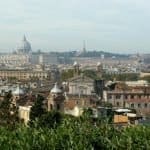 Hotel La Perla is home to ‘Mahatma’ one of the world’s most remarkable wine cellars and we take a tour before leaving. The cellar showcases over 28,000 bottles of wine and over 2,000 labels. 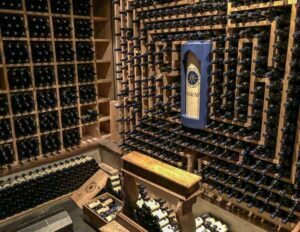 Its private collection of Sassicaia wine is the world’s largest. Guests dining at La Stüa de Michel can reserve a visit to the cellar when booking a table. Allow 30 minutes for the tour and be prepared for surprises and sensory immersion. The wine theme continues into the next day. Our ski guide, Hubert, schusses expertly down the piste towards a distant mountain hut. His emerald-green ski jacket stands out against the snow and we follow him down the slopes albeit far less elegantly. 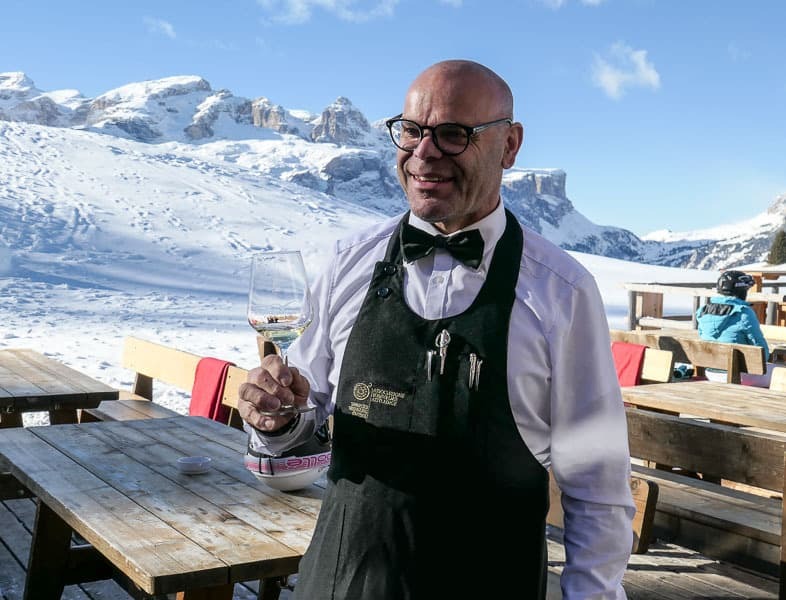 On arrival at I Tablá mountain hut Hubert whips off his ski jacket and becomes none other than Tyrolean super-hero ‘Sommelier on the Slopes’ resplendent in sommelier’s black apron, dress shirt and bow tie. 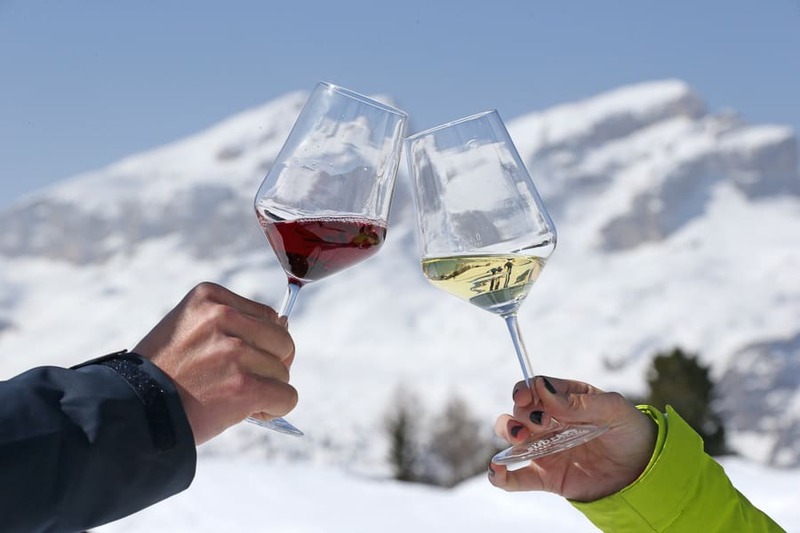 Sommeliers on the Slopes offer ski tours paired with some of the South Tyrol’s finest wines. The tours, sensibly, take place after lunch (not included) and run from 1:30 pm – 4 pm. 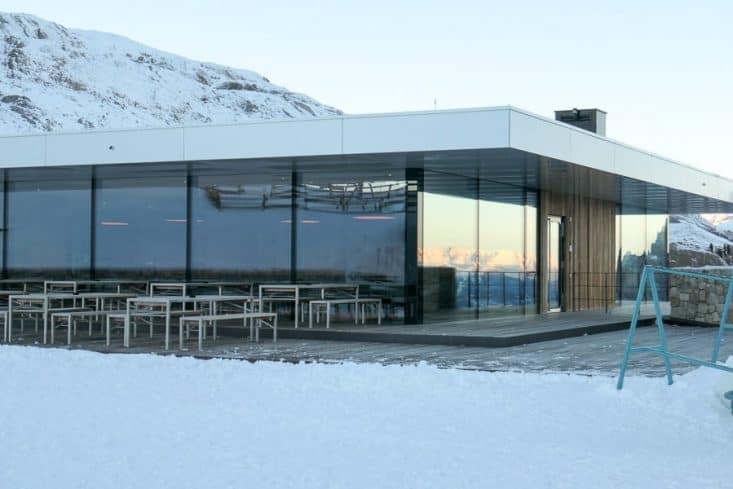 A qualified sommelier guides guests to three mountain huts with two wines tastings in each hut. 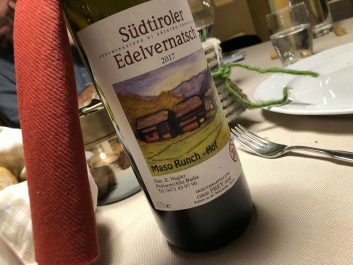 Very few of these local wines actually make it beyond the mountains and I can see why the Ladin people want to keep them to themselves. This tour is a great opportunity to sample some wines that you won’t find at home. Chatting to Hubert on the ski lift he told us that, like most good ideas, the inspiration for the tour came over a bottle of the region’s wine. Possibly two. Four more dates are planned for this season (29th January, 5th and 19th February and 12th March) with tickets costing €30 per person. The event is organised by South Tyrol Wine Consortium and South Tyrol’s Sommelier Association. I’d advise early booking as, not surprisingly, tickets sell out fast. 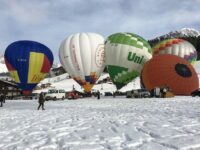 They can be bought in advance through Alta Badia Tourism Office. 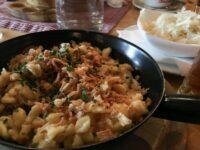 We spend some piste time building up an appetite for a long lunch at Ütia de Bioch mountain hut. 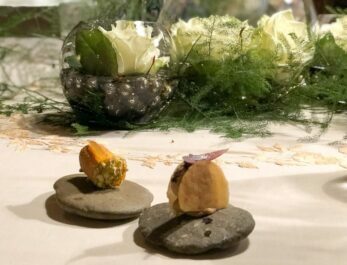 The recently refurbished refuge has partnered with three Michelin starred Norbert Niederkofler. 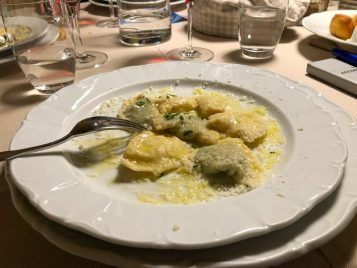 I choose Tortelli stuffed with speck cream, bufala ricotta on mashed ‘risina’ beans and balsamic vinegar which was simple, delicious and beautifully al dente. 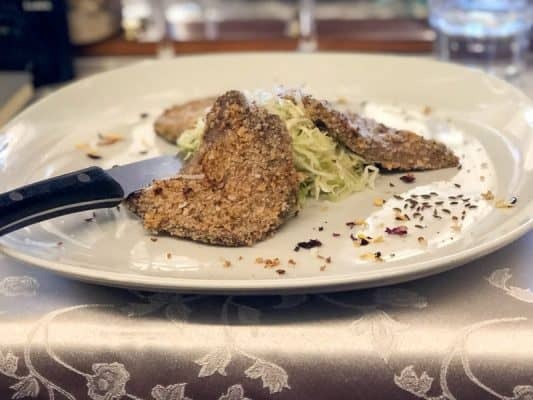 Crispy brisket in ‘Püchia’ crust, cabbage and radish salad followed and was equally delicious. 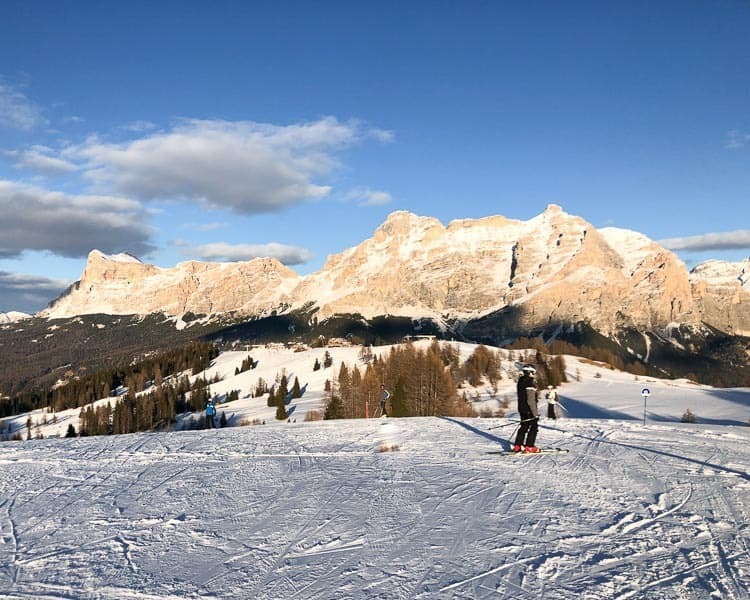 We finish the afternoon with a gentle ski back down to San Cassiano taking time to enjoy our last moments amid the grandeur of the Dolomites. Dinner on our last evening is at our Alta Badia hotel but I’ll save that for my next post, a ski guide to Alta Badia. I’ll also include a short review of our hotel in San Cassiano. 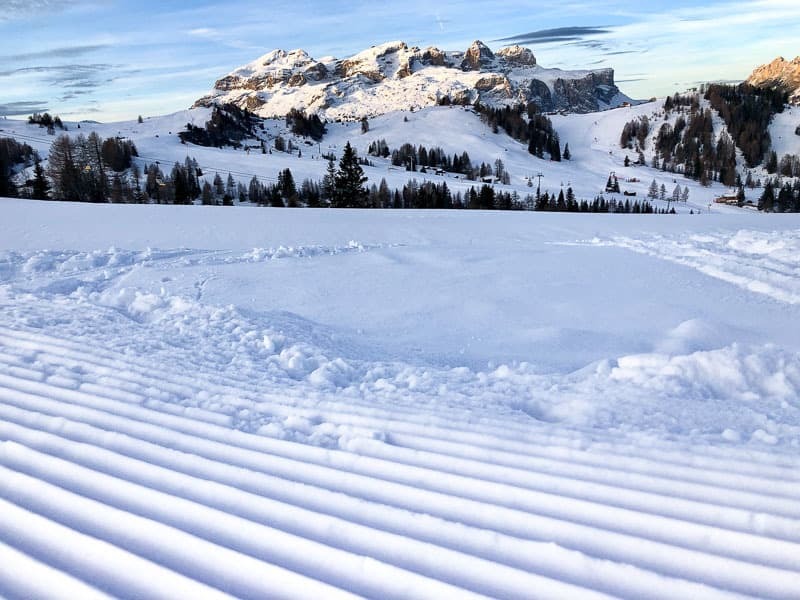 If skiing against the dramatic backdrop of the Dolomites gets your pulse racing then skiing Alta Badia, Italy might just be your bag. 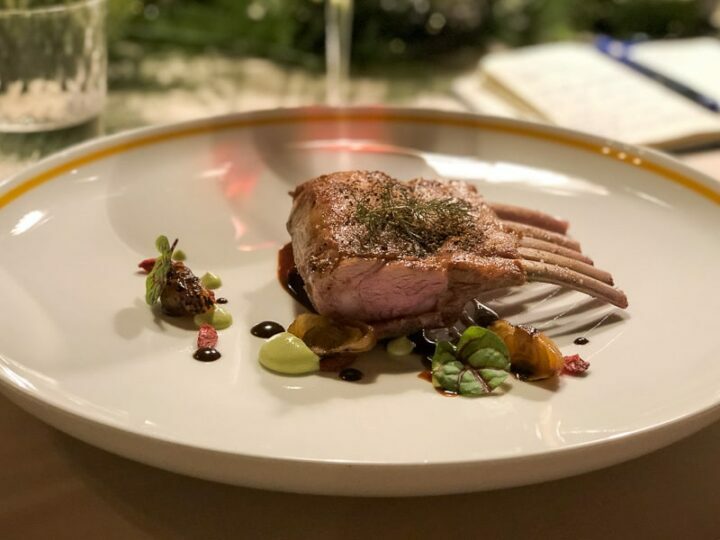 Pair this with world-class wines, gourmet food and centuries of Ladin culture and it could well be the start of a long and lingering love affair. 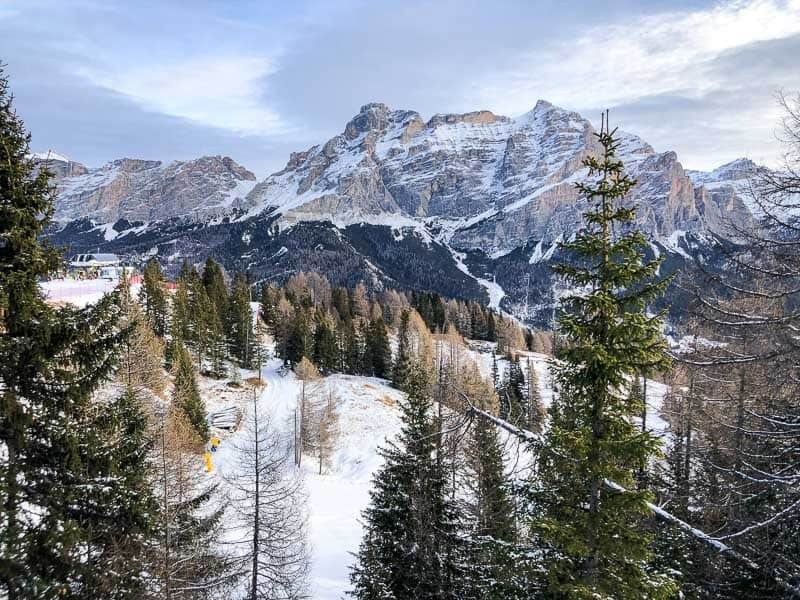 Inghams offers a seven-night stay at the four-star Hotel Diamant in San Cassiano, the Italian Dolomites, from £1,189 per person based on two sharing on a half board basis. Price includes return flights and airport transfers. To book, visit www.inghams.co.uk/ski-holidays or call 01483 791 114. Many thanks to Inghams and Alta Badia Tourism who kindly invited me to visit. All thoughts, opinions and mountain hut love are entirely my own. 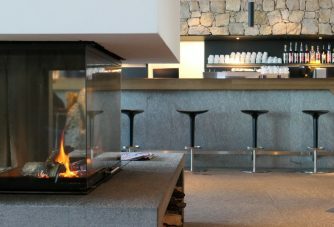 I’m a bit fan of the snowy mountains anyway but add in some gourmet Italian wine and food and you’ve definitely got me convinced! 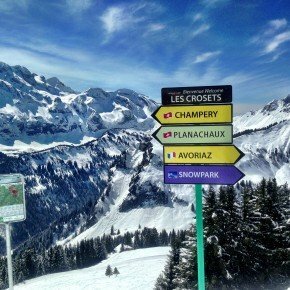 Mrs Jones, what a fantastic adventure … snow, views, breathtaking surroundings, food and wine … who cares about the sloops and the skiing???!!! Once again the best storyteller and the images are just fabulous. That rack of lamb would suit me perfectly. Thanks for bring me along. The food everywhere was soooo good. This is one trip I’d happily repeat every year! What a great angle and read. Talk about a romantic break! It’s a fabulous way to ski and yes wouldn’t that make a wonderful Valentines break!